Visionary Artist Sister Corita Kent and her Ten rules for Students, Teachers and Life. A chance encounter with a sand painting helped me learn how to doctor patients I knew I would lose. As a palliative care doctor, I spend much of my time face-to-face with pain and suffering, debilitating disease and death. When I began my training, I thought I was comfortable with the idea of mortality, and with the notion that fighting death at all costs wasn’t the sole purpose of medicine. But I hadn’t expected that the type of medicine I’d chosen to practice would require a strength and perspective that medical training hadn’t offered. It was a chance encounter with a sand painting that helped me learn how to doctor patients I knew I would lose. At the time, I was in the middle of my yearlong fellowship in hospice and palliative medicine, seeing patients at a county hospital in San Jose. I’d immersed myself in learning how to treat patients living with serious illnesses: end-stage heart failure, widespread cancer and devastating strokes. I’d learned how to help families anticipate what dying looks like. It had become second nature to talk openly with patients about the severity of their diseases, and to ask them how we might work together to maximize joy, meaning and comfort in their waning lives. I hoped that projecting an acceptance of death and comfort with it might soothe my patients and their families. But I had grown progressively more anxious, and occasionally despondent. I didn’t understand why death had come for a 35-year-old mother of three with a rare and aggressive cancer, or why a marathon runner was dying after a sudden heart attack when he’d been a marathon runner. My parents, both Hindus, had taught me that understanding death as inevitable is necessary to appreciate the meaning and beauty of life. But knowing this didn’t make it any easier to lose patients within days of meeting them. One of my attending physicians noticed that I’d become more withdrawn, less punctual and occasionally distracted. “This is difficult work,” she told me gently, reminding me that I’d need to care for myself in order to care for my patients. I tried massages, therapy, hiking and meditating under the shade of Marin County redwoods. But when my sadness grew stronger, I longed for a place where I might find community among others searching for support. I found a Vietnamese Buddhist temple that was just a short drive from the hospital. There I whispered the Sanskrit and Punjabi prayers I’d learned as a child. Sometimes I approached the altar and spoke quietly to the statue of Buddha: Help me find the strength to do this work. Show me how. Please, take away my sadness. One evening, the temple’s main hall was unusually crowded. People had gathered around a group of Tibetan monks hunched over a table, where they were creating a sand mandala. Metal cups filled with sand of every conceivable color — bright pink, deep navy blue, silver, maroon and mustard yellow — lined one end of the table. I remembered my father pointing out a photo of a mandala in a museum years ago, explaining that its circular shape symbolized both the cyclical nature of birth and death and the indestructible nature of the universe. 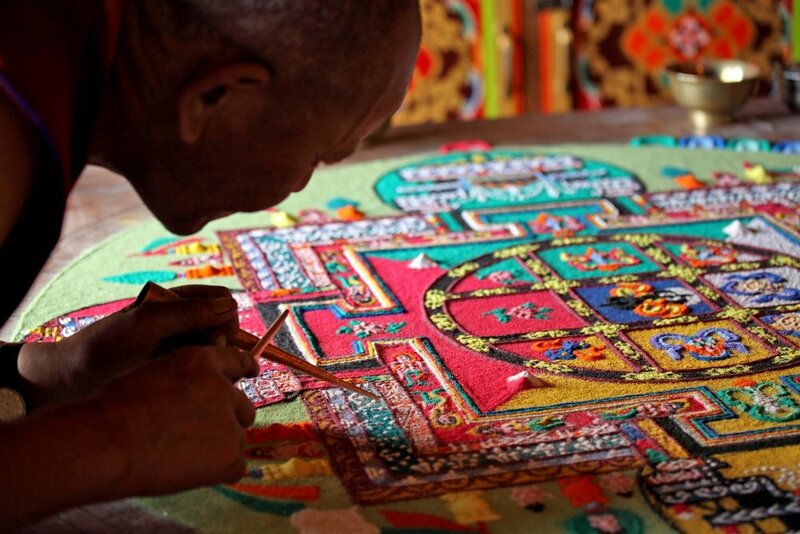 Using small scrapers and metal funnels, the monks methodically piped precise amounts of sand to create an intricate geometric pattern. That first evening, they painted a flower with multicolored petals. By the next evening, the flower was surrounded by circles of deep blue and pink and rectangles of turquoise and gold. The following Sunday morning, the temple was overflowing with people. We all looked on as the group of brightly robed monks surrounded the mandala and began to chant in low, guttural tones, their eyes closed and palms pressed together. I stood on my toes and craned my neck to glimpse the mandala, hoping to see it encased in glass. Instead, I looked on in shock as one of the monks began to move a feathery brush over the mandala, swirling together the gold and the navy, the circles and the rectangles. He moved along the edges of the table, sweeping away his work just as methodically as he had placed grains of sand in the same space, transforming the mandala from pattern to pile. Hot tears filled my eyes, not only because the mandala was gone, but because the hands that had created it were content to let it go. The Bhagavad Gita, which my father had read to me as a child, emphasizes that change is the law of the universe. The Vietnamese monk Thich Nhat Hanh reminds us that “impermanence does not necessarily lead to suffering. What makes us suffer is wanting things to be permanent when they are not.” Yet it was the sweeping away of a sand painting that helped me truly understand that change and impermanence are not just spiritual tenets but laws of nature — ones that I’d struggled against and had been taught to ignore throughout much of my medical training. Just as I’d expected that the gorgeous mandala had been created in order to be preserved, I had also expected that my patient in her 30s should live to see her children graduate from college, that the marathon runner should have lived to run more races. I’d expected, partly as a result of my medical training, to change and control what wasn’t necessarily mine to change and control. How might I doctor my dying patients differently if I remembered that everything worldly — a painstakingly crafted mandala, a sky ablaze with color, our fragile human lives — is also temporary and subject to change? Accepting that life is finite wouldn’t prevent me from drawing upon science to diagnose and treat disease, to use every tool available in medicine to alleviate suffering. But I wondered if it would make it easier for me to endure the inevitability of change and loss that both my patients and I would experience. Perhaps it could bring me solace to remember that just as my patients’ lives are temporary, so is their suffering. I wiped my eyes as I looked upon the remaining heap of swirled sand, itself a thing of great beauty. The monks scooped teaspoons of sand into plastic bags, handing one to each of us. Through the bag, the sand felt both tough and soft, the bright blues and pinks particularly visible when I held it up to the light. When I returned to the hospital the next day, I thought of the mandala as I sat with a breathless man my own age dying from lung cancer, and an agitated grandmother in the final stages of dementia. I would feel compassion for both of them, but I didn’t leave work that day consumed with grief, withdrawn and disengaged. By accepting my patients’ circumstances, rather than fixating on their inherent tragedy, I could focus instead on changing what I could: easing breathlessness and agitation, explaining hospice services to their despondent families. Before leaving the hospital that night, I removed the bag of sand from my wallet, holding it up to the light as I have so many times over the past five years when I’ve needed to remind myself of the circularity of all things, of change as life’s only constant. Where is the artist from? Describe the artists work as if you were describing it to a friend on the phone who cannot see it. What do you think the artist's work is about? What makes you think this? Do you like the work? Why or why not? How might the artist's ideas influence your work? Are there any connections or interesting ideas you could continue to explore? Sure, it’s become a wellness fad. But it’s the best way I’ve found to keep digital monsters at bay. Because I live in Northern California, where this sort of thing is required by local ordinance, I spent New Year’s Day at a meditation center, surrounded by hundreds of wealthy, well-meaning, Patagonia-clad white people seeking to restore order and balance to their tech-besotted lives. In the past, I might have mocked such proceedings, but lately I’ve grown fond of performative sincerity in the service of digital balance. It’s the people who haven’t resigned themselves to meditation retreats who now make me most nervous, actually. Which brings me to my point: It’s 2019. Why haven’t you started meditating, already? Why hasn’t everyone? I’ve been a technology journalist for nearly 20 years and a tech devotee even longer. Over that time, I’ve been obsessed with how the digital experience scrambles how we make sense of the real world. Technology may have liberated us from the old gatekeepers, but it also created a culture of choose-your-own-fact niches, elevated conspiracy thinking to the center of public consciousness and brought the incessant nightmare of high-school-clique drama to every human endeavor. It also skewed our experience of daily reality. Objectively, the world today is better than ever, but the digital world inevitably makes everyone feel worse. It isn’t just the substance of daily news that unmoors you, but also the speed and volume and oversaturated fakery of it all. A few years ago, I began to fear that the caustic mechanisms of the internet were eating away at my brain, turning me into an embittered, distracted, reflexively cynical churl. Since then, I’ve done everything I can to detox. I consulted app blockers and screen-time monitors to keep me offline. I even got my news from print newspapers in order to experience a slower, more deliberate presentation of media. But there are limits to the supposedly life-changing magic of going offline. Smartphones are as central to the economy as cars and credit cards, and a lot of people have little meaningful opportunity to quit. And the “offline” world is now ruled by what happens online. Escape is impossible. Quips on Twitter are indirectly programming cable news, and whatever lengths you might go to to shield your kid from the dark powers of phones, her social life will still rise and fall according to the inscrutable dynamics of Instagram and Fortnite. And so, to survive the brain-dissolving internet, I turned to meditation. Don’t roll your eyes. You’ve heard about the benefits of mindfulness before. Meditation has been rising up the ladder of West Coast wellness fads for several years and is now firmly in the zeitgeist. It’s the subject of countless books, podcasts, conferences, a million-dollar app war. It’s extolled by C.E.O.s and entertainers and even taught in my kids’ elementary school (again, it’s Northern California). The fad is backed by reams of scientific research showing the benefits of mindfulness for your physical and mental health — how even short-term stints improve your attention span and your ability to focus, your memory, and other cognitive functions. I knew all of this when I first began meditating a year ago, but I was still surprised at how the practice altered my relationship with the digital world. At first, it wasn’t easy: After decades of swimming in the frenetic digital waters, I found that my mind was often too scrambled to accommodate much focus. Sitting calmly, quietly and attempting to sharpen my thoughts on the present moment was excruciating. For a while, I flitted among several meditation books and apps, trying different ways to be mindful without pain. Then, about four months ago, I brute-forced it: I made meditation part of my morning routine and made myself stick with it. I started with 10 minutes a day, then built up to 15, 20, then 30. Eventually, something clicked, and the benefits became noticeable, and then remarkable. The best way I can describe the effect is to liken it to a software upgrade for my brain — an update designed to guard against the terrible way the online world takes over your time and your mind. Now, even without app blockers, I can stay away from mindless online haunts without worrying that I’m missing out. I can better distinguish what’s important from what’s trivial, and I’m more gracious and empathetic with others online. As far as I know, people are still wrong on the internet, but, amazingly, I don’t really care anymore. I can anticipate your excuses. First, this is all very old news: As Buddhists have known forever, meditation is really good for you, and The New York Times’s new Op-Ed columnist is On It. And second, it’s all a bit too woo-woo — it sounds promising, but you’re not one to go full Goop. Still, I hope you give it a try. I hope everyone does. (The Times’s David Gelles has written a great guide for getting started.) I’m not promising meditation will fix everything about how the internet has ruined you. But what if it does? A version of this article appears in print on Jan. 9, 2019, on Page A23 of the New York edition with the headline: You Should Meditate Every Day. The Chinese artist Ai Weiwei is internationally recognized for his massive, often provocative art installations. And yet, he's spent most of the past decade under house arrest for his persistent defense of free expression. But as soon as his passport was reissued by the Chinese government a couple of years ago, Ai embarked on possibly his most ambitious project yet: documenting the global refugee crisis. The result of his cinematic journey, Human Flow, is out this week. Ai spoke with NPR about his new documentary, which aims to describe what's become the largest forced migration since World War II — 65 million people displaced by war, famine and climate change. But instead of following the experience of any one group of asylum seekers, Ai takes a more expansive tack, traveling to 23 different countries over the stretch of a year. Employing drone views, the film charts the journeys of divergent populations, including Syrians, Kenyans, Kurds, Palestinians and the Rohingya. It's a theme that also hits home for the Chinese dissident, having grown up in isolation with his poet father, who was exiled from China. "Being a refugee is much more than a political status," Ai says. "As a human being, if you sit in front of any of them, if you look in their eyes, you immediately understand who they are." I was born after the year my father was criticized as an enemy of the people. In China, that's the biggest crime you can have. My father is simply a poet, a very well-known poet. So he had been exiled [and] I grew up with him in a very remote area, the desert actually, in northwest China. So I personally experienced how people have been mistreated and, of course, also really punished, for the crime he never really committed. So I share this kind of sentiment of people who miss everything and lost everything. Being a refugee is much more than a political status. It is the most pervasive kind of cruelty that can be exercised against a human being. By depriving a person of all forms of security, the most basic requirements of a normal life, by cruelly placing that person of inhospitable host countries that do not want to receive this refugee. You are forcibly robbing this human being of all aspects that would make life, not just tolerable, but meaningful in many ways. As a human being, if you sit in front of any of them, if you look in their eyes, you immediately understand who they are. They are just like your brothers or your sisters or your own children or your grandma. It's nothing different. It's only something you can see from their eyes. They have courage. They can give up everything, just for safety or shelter, or to see their children's future maybe will change because they take this action. I have great sympathy for them, for the lacking of knowledge, and as a result, lacking of the understanding of humanity, and also [how they] underestimate their own possibilities to help another person, which can be considered as the highest ritual in many, many religions — just helping someone. Never to say this is too big or it's not my problem. I do have a great, deepest sympathy for people who don't have a clear vision about the world and about themselves, [and] don't understand the value of life. I stumbled upon this online at (My Alma Mater) Tyler School of Art's website. Chloe was a prior student at CAPA in Philadelphia. She was awarded this award her freshman year at Tyler. It's always great to see young artists doing what they love! Are you thinking about going to Art School? Let's talk! The Foundation Program has awarded three students one of the three Dean’s Foundation Awards. Students are selected by a faculty jury and representatives from the Dean’s office based on their work. The award is given to students who created excellent work in one of the three areas of the foundation curriculum. The creation of this piece was focused mainly on exploring the figure in large scale as well as creating a sense of drama through use of light. As a self-portrait I have depicted myself in my room, where I spend a good portion of my time. I chose to place myself in front of an open fridge, where a lot of women and girls feel most insecure as a result of social pressures to eat less than men, or not eat at all. The connected gaze with the viewer, the choice of clothing, and the act of drinking milk from the bottle, are efforts to take back power within these societal constructions. Jim Carrey is a man of many talents. While most fans know the actor for his comedic work on screen, a new documentary short is introducing the world to Carrey, the painter. The actors says he first started painting as a way to cope during an emotionally hard time. And he’s been hooked ever since. Although the short film, directed by David Bushell was posted 2 weeks ago, it recently went viral with celebrities such as LeBron James, Jane the Virgin‘s Brett Dier and Supergirl’s Chyler Leigh tweeting their praise of Carrey’s work. Why Bother with an Underpainting? I found the following images on Anne Kullaf's Blog Loosen Up. It is an excellent example of underpainting and the development of a painting. 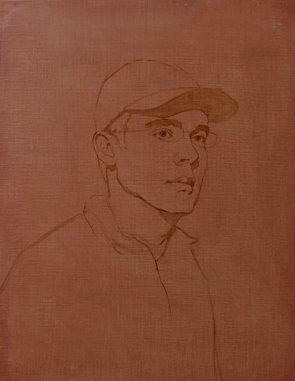 This first image shows an incomplete underpainting that resolves issues of proportion and begins to address value. This underpainting was done using a tinted ground (gesso and some light red ochre) and burnt umber. The values are beginning to be established by the use of washes to block in medium and light values and an undiluted application will block in the darker values. Notice in this slide the underpainting is blocking in the rest of the background information. Underpaintings are meant to establish a firm structure for your painting but do not need to be resolved and finished in the same way that a finished painting is finished. Notice how loose and gestural the figures and marks are. This slide illustrates the initial blocking in of color. Notice that we are working with large simple blocks of color or shape, always work from large simple shapes down to smaller more complex shapes. Resist the urge to jump into details. More color is being introduced. Notice that the artist is starting to work into smaller shapes and that some areas of the underpainting are showing through. You do not have to always use a neutral color but you can see here why it may be helpful because it is harmonious with the palette being used. Imagine if the preliminary underpainting was completed in a bright red or neon green and imagine the effect that might have. The artist is continuing to refine the painting and developing a nice range of values by mixing tints tones and shades of color. Edges are being cleaned up and objects are brought to a higher level of clarity. This is the finalized painting. At this point, the artist has provided "eye candy" using fully saturated jewel-like colors to add details like the lettering in the sign for the restaurant. This is a detail of one of the figures in this painting. This is a wonderful example that sometimes less is more. The face of this figure is merely suggested through tonal variation as opposed to being meticulously rendered. As an artist, you will have to make decisions about how much information to supply the viewer. 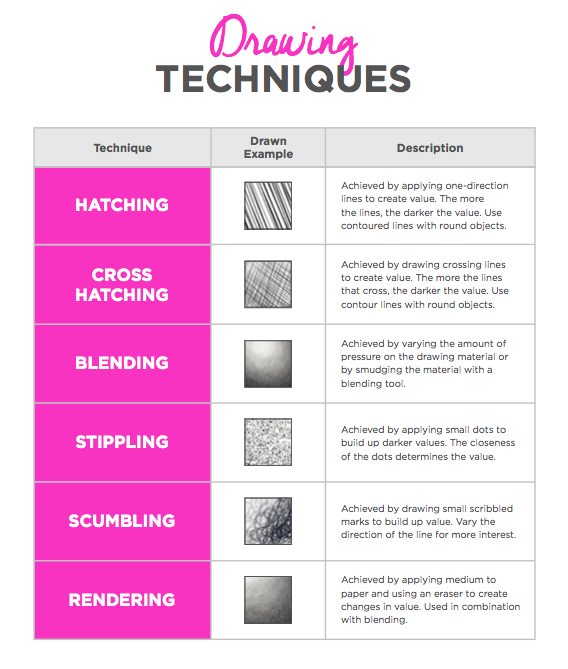 This is an extremely useful tool to guide the viewer's eye around your work. Complete the slideshow above and follow all directions to begin project. Please watch the video below and complete the “Art21” Worksheet. Complete the questions for Artist Nick Cave. Be sure to write in complete, grammatically correct sentences and to include your name on the worksheet so you can receive credit for your work. When you are completed you make read the articles or watch the other Art videos posted under the Current Events tab of our class website. Have a great day, see you all tomorrow! Begin by planning your design. To start you will need to fold your paper into a series of triangles. Watch the video down below for instructions on folding your paper. 2. Next you can start your design by drawing any shapes, lines or patterns you wish on your folded triangle. Variety is the spice of life, it also makes your artwork stand out when used masterfully, be careful though too much of a good thing will spoil it. Tr to avoid overly chaotic designs as they can be a real headache to transfer and paint later. 3. Open your triangle up and fold it over so that you can see its reflection in the triangle to the right/left of its original location. Using the windows in our classroom or the light table trace the design so that you have a perfect reflection on your paper. Continue this process until all of your triangles are completed. Achromatic: One neutral hue (color) adjusted up and down in value. Monochromatic: One hue adjusted up and down in value. Analogous: 3-4 hues located next to one another on the color wheel. Complementary: 2 colors that sit directly opposite one another on the color wheel. Triadic: Colors evenly spaced creating a triad or triangle shape on the color wheel. Examples include red, blue, yellow or green, orange, violet. ** It’s smart to have a plan before you begin painting, otherwise you might find yourself stuck in a corner with no way out other than to start the entire project over… never a fun place to find yourself. Ben Franklin famously stated “An ounce of prevention is worth a pound of cure”. Achromatic Color Scheme: Neutral hue adjusted up and down in value. Monochromatic Color Scheme: 1 color adjusted up and down in value. Analogous Color Scheme: 3-4 colors located next to one another on the color wheel. Complementary Color Scheme: 2 colors located directly opposite one another on the color wheel. Before beginning your painting complete this worksheet. Part of your challenge is to use all of the colors on a color wheel and to make sure that your fades are smooth and clean. Happy Painting! Select 3 or 5 objects from class still life objects with your group. Using our Types of Composition handout mimic one type of composition and decide on a viewpoint as a group. Mr. Barron will print copies of this image for every group member to work from as a reference. Practice with Charcoal media and create a thumbnail sketch of composition. Begin blocking in of basic forms on grey paper, begin simple and develop more complex shapes as drawing progresses. Develop shadow areas with compressed charcoal and highlights with kneaded eraser and white charcoal pencils. Step back to look for areas that need additional development… rework those sections until you are satisfied with the entire piece. More than a century before Miller and a century and a half before Barry, the great Victorian art critic, philosopher, and philanthropist John Ruskin (February 8, 1819–January 20, 1900) examined the psychology of why drawing helps us see the world more richly in a fantastic piece unambiguously titled Essay on the Relative Dignity of the Studies of Painting and Music, and the Advantages to be Derived from Their Pursuit, penned when he was only nineteen. It is included in the first volume of the altogether indispensable The Works of John Ruskin (public library | free ebook). It’s a beautiful meditation triply timely today, in an age when we — having succumbed to the “aesthetic consumerism” of photography — are likelier to view the world through our camera phones and likelier still to point those at ourselves rather than at nature’s infinite and infinitely overlooked enchantments. To draw today is to reclaim the dignity and private joy of seeing amid a culture obsessed with looking in public. Let two persons go out for a walk; the one a good sketcher, the other having no taste of the kind. Let them go down a green lane. There will be a great difference in the scene as perceived by the two individuals. The one will see a lane and trees; he will perceive the trees to be green, though he will think nothing about it; he will see that the sun shines, and that it has a cheerful effect, but that the trees make the lane shady and cool; and he will see an old woman in a red cloak; — et voilà tout! But what will the sketcher see? His eye is accustomed to search into the cause of beauty, and penetrate the minutest parts of loveliness. He looks up, and observes how the showery and subdivided sunshine comes sprinkled down among the gleaming leaves overhead, till the air is filled with the emerald light, and the motes dance in the green, glittering lines that shoot down upon the thicker masses of clustered foliage that stand out so bright and beautiful from the dark, retiring shadows of the inner tree, where the white light again comes flashing in from behind, like showers of stars; and here and there a bough is seen emerging from the veil of leaves, of a hundred varied colours, where the old and gnarled wood is covered with the brightness, — the jewel brightness of the emerald moss, or the variegated and fantastic lichens, white and blue, purple and red, all mellowed and mingled into a garment of beauty from the old withered branch. Then come the cavernous trunks, and the twisted roots that grasp with their snake-like coils at the steep bank, whose turfy slope is inlaid with flowers of a thousand dyes, each with his diadem of dew: and down like a visiting angel, looks one ray of golden light, and passes over the glittering turf — kiss, — kiss, — kissing every blossom, until the laughing flowers have lighted up the lips of the grass with one bright and beautiful smile, that is seen far, far away among the shadows of the old trees, like a gleam of summer lightening along the darkness of an evening cloud. Is not this worth seeing? Yet if you are not a sketcher you will pass along the green lane, and when you come home again, have nothing to say or to think about it, but that you went down such and such a lane. From the most insignificant circumstance, — from a bird on a railing, a wooden bridge over a stream, a broken branch, a child in a pinafore, or a waggoner in a frock, does the artist derive amusement, improvement, and speculation. In everything it is the same; where a common eye sees only a white cloud, the artist observes the exquisite gradations of light and shade, the loveliness of the mingled colours — red, purple, grey, golden, and white; the graceful roundings of form, the shadowy softness of the melted outline, the brightness without lustre, the transparency without faintness, and the beautiful mildness of the deep heaven that looks out among the snowy cloud with its soft blue eyes; — in fact, the enjoyment of the sketcher from the contemplation of nature is a thing which to another is almost incomprehensible. If a person who had no taste for drawing were at once to be endowed with both the taste and power, he would feel, on looking out upon nature, almost like a blind man who had just received his sight. The Works of John Ruskin is a trove of timeless wisdom in its totality. Complement this particular piece with Miller’s wonderful To Paint Is to Love Again and Ruskin on the value of imperfection in creative work. If you’re looking to learn this enormously rewarding way of seeing, Drawing on the Right Side of the Brain is by far the best initiation. Who might benefits from this practice? What is one way you could help increase your ability to see what is around you throughout the day? Where is there the most need for this? Take 5 minutes to observe the room, choose a spot that stands out as interesting or exciting and begin recording what you see in your sketchbook. develop your drawing for a total of 15 minutes. Compose a drawing of manmade and organic objects to create a dynamic composition. Select a manmade object, develop a 3-5 minute Blind or Regular continuous or non continuous contour drawing. Work large. Select an organic object, develop a 3-5 minute Blind or Regular continuous or non continuous contour drawing. Work large. Repeat until you have 3-5 images. Carefully cultivate value and gradients in your work using the HB, 4B and charcoal pencils, remember that darks will receded (move back) and lights will advance towards the viewer. For extra credit you may complete an additional superimposed drawing on black paper using the white charcoal pencil to explore working on a darker ground/paper. Create an assortment of drawings using a variety of techniques and approaches. Step 1: . Select a simple image for drawing. Step 2: Create a 4" x 4" grid on your 12" x 12" paper. This course is designed to provide a broad overview of drawing x painting. A variety of methods, materials and techniques will be introduced to encourage exploration, experimentation and development of skill and knowledge. The content for this class will be derived from the four components below which I believe will ensure a well-rounded art education experience. • Art History- Acquiring knowledge about the contributions artists and art make to society and culture, acknowledging the contributions of other cultures. • Art Production- Making and creating art! Painting X Drawing is taught in three sections. methods, procedures and color theory. abstraction, issues in contemporary art, student voice and conceptual development. exam after the completion of each project lesson. class, distributed and collected during class time. • Listen to and follow directions. • Raise your hand to contribute. • 1 point for entering class quietly. • 1 point for listening attentively. • 1 point for good effort. • 1 point for cleaning your space and leaving quietly. • Please come into the studio ready for creative action. • Take folders and sketchbooks out upon entering the room. • Please do your best to focus on your work with minimal talking/distractions. in the Marble Composition book. This is for school and student safety purposes. that involve you missing class. Additional studio time to work on projects: see white board for availability/times. I’m looking forward to getting to know you and working with you this year! Complete a “realistic” self portrait from observation. You may use your cell phones to take a photograph of yourself. Email the image to yourself and use a Chromebook to view the image (Chromebook screens are larger than cell screen). Try to get as many light and shadow / “details” as you can. When completed please create 1 thumbnail (quick sketch) of your portrait in each of the 4 different stages of abstraction, try not to spend more than 10-15 minutes per sketch. With the assistance of an elbow partner, select the most successful / exciting of your thumbnail sketches to develop into a color study. Complete your color study in your sketchbook in colored pencil, when completed show it to Mr. Barron for a quick review/critique. Sign your work on the bottom right corner discreetly or on the back of your panel. FIRST: Identify which painting your group will remix by looking through the transparency binders at your tables. NEXT: Begin transferring your design via the overhead projector sheet. Help one another out and take turns to transfer your image. THEN: Identify your monochromatic (one color) palette and practice your edge and gradient control with shapes worksheet. FINALLY: Refine, re-work, pause, observe and reflect on the work you have completed. Look for areas that are not working or resolved yet and continue to develop/work on those areas until they “work”. Create a self portrait in a traditional renaissance style grisaille and glaze technique utilizing one of the following tropes for mystery in your composition: a window, a doorway or a stairway/well. Create a self portrait in a vibrant saturated palette traditional to the fauve style of painting. Utilize one of the following tropes for mystery in your composition: a window, a doorway or a stairway/well. Watch the following video for the concept behind this assignment. Then begin by working from photographs you have taken following the artists instructions from the video. You will then choose between the two approaches presented in this unit: Renaissance style Grisaille and Glazing (Indirect Painting) or the Fauve Style Saturated Color approach. The main difference between level I, II & III lies in the conceptual and performative elements of level III. Choose a color approach that best communicates your experience. Be sure to watch all 3 videos and consider how to best compose and arrange your portrait to convey your experience of becoming someone else to your viewer. Best of luck and happy painting! Complete the slideshow above. ** Be sure to click all BLUE/GREEN text links to watch videos. Select the concept or idea presented that is most exciting to/for you. Personal choice (anything you want that is school appropriate). NEXT: Remix or compile your images into a new unique final composition (refer to your composition sheets in SB, select 1 compositional strategy to follow). Be sure to have a study/drawing in grayscale to work from for your underpainting. THEN: Build, Stretch and Gesso your canvas. Complete your underpainting in Burnt Sienna. Warm colors appear closer to the viewer, cool colors appear further away. Mix Burnt Sienna or gray to a color to make it duller/desaturated, this works well for making things appear further away/in shadow. Objective: Focusing on the theme of Identity... Who am I? Students will create a fully realized drawing or painting. Full Body: Open concept, showing your entire body. Must have a clear foreground Middleground and Background. Smashed Face: Grid-based portrait pressing your face against the glass windows to create distortion. Opposite/Shadow: Create a portrait of your shadow side/opposite. This should be done subtly using symbolism and visual metaphor, avoid literal depictions. Foreground Middleground and Background required. Mythological Figure: Using a mythological figure as an archetype for your personal qualities/character. Foreground Middleground and Background required. Still Life: Use an odd number (minimum of 3) symbolic objects that you have a personal connection to and create a dynamic (exciting!) still life arrangement in a corner. Since the studio is shared with 250+ student artists each day, I strongly suggest you set up your still-life at home and photograph it. Foreground Middleground and Background required. Renaissance Portrait: Create a portrait using the imprimatura and glazing method of indirect painting to develop and tonal painting. Complete 4 Thumbnail sketches to develop your compositions and ideas. Finalize 1 Graphite Value Study prior to starting on your good paper/board/canvas. All Work due the second to last week of class for grading. To begin, find a comfortable position, sitting or lying down. You may want to place your hands in your lap or at your sides. Close your eyes if you wish, or focus your gaze on one spot. Notice how smooth, calm, and regular your breathing is. Now that you are starting to become more relaxed, let's focus on becoming more playful. Everyone has the ability to be playful. Playfulness is a trait that we all have inside, but for many of us, playfulness has been pushed aside as we strive to be more serious. The ability to be playful is important because it allows you to experience fun and joy. Becoming more playful also allows you to respond to challenges with humor and lightheartedness instead of always being serious or becoming defensive. It is important to have a balance between being serious and being playful. You can use both of these qualities to handle situations effectively. Becoming more playful is possible, whether you have never been very playful before, or if you used to be playful but have lost touch with this quality. Think about a time when you were playful. Were you playful as a child? As an adolescent? As an adult? Maybe you cannot recall a time when you were playful. That's okay. You still have a playful inner child that you can nurture. Create a mental picture of yourself when you were playful, or think about positive memories of yourself as a child. Imagine your playful or childhood self, creating all the details you can in your mind. What did you look like? What was it like to be playful? See yourself as this playful child, imagining all the details. Now use your imagination to create a picture of a dreamlike place where you have woken up. Look around you, you will notice immediately that it is a place, space or environment that you recall or remember from your childhood. Take a second to look around, remember what it was like to be in this place. When you look down you notice an object at your feet that you loved as a child. You pick it up and hold it in your hands, how does it feel in your hands? You’re attention then drifts to a figure in the environment. You’re positive you know them. Notice their features, the color of their eyes, and the way their hair looks. What type of clothing are they wearing? Gradually re-awaken your mind and body by feeling yourself in this space, open your eyes and sit quietly for a few moments, becoming more aware of your surroundings. Emotions/Sensations you experienced can be used to help choose palette, style, etc. Create a mixed media collage based on this experience. This will be the basis of your next painting. Decalcomania: Like a Rorschach inkblot, find new images within the blobs and use those as a starting point for a weird mind-bending image. Entopic Graphomania: Use the imperfections or messed up parts of your paper become connection points for a net-like design to discover new forms, creatures, environments etc. Exquisite Corpse: Fold a paper into 3 sections, have one person draw the head of a person, creature, animal etc. Next person draws a body of a person, creature, animal etc. Next person draws the legs of a person, creature, animal etc. Frottage: Use straws or just your mouth to blow wet paint or ink to create wild splatter marks to find images, forms, creatures, environments etc. Experiment with a variety of image generating processes developed and used by the surrealist painters circa the early 1920’s. Develop and refine a surreal painting using a minimum of one surrealist process and one technique discussed in class. Use at least 1 surrealist strategy in your painting. Develop/cultivate craftsmanship and the artistic studio habits of mind. Complete Visualization in class or on website if absent. Create Collage based on visualization notes and experience. Complete the other 4 surrealist strategies for brainstorming idea mining. I am going to give you a series of instructions to follow. These instructions are intentionally cryptic or unclear/vague. You can’t ask any questions. You must reason your way through the problem. Using line only, draw one simple geometric shape, such as a square, triangle or circle. Without overlapping or intersecting, draw a different shape. Now draw another, choose your favorite. Make the other two like your favorite. Enlarge one of the shapes. Make one shape touch one edge of the page. Make the other 2 touch two different edges. Without moving the shapes from the sides, make each touch the other two. Introduce a new shape that is different. Keeping the original 3 shapes in the same place, make them like the new shape. Make one shape larger than all of the others. Make one 50% smaller than the largest shape. Make one of the remaining two shapes touch 2 sides of the paper. Discuss your experience/process with a partner. Cut your paper in half so you have 2 sheets with 6x12 squares. Create one abstraction using a repeated shape, stroke, design or pattern. Vary your placement and scale/size to create variety. When you have completed a design in each square come back and attempt to balance and harmonize your design until you are satisfied, ask classmates for their opinions and advice. Create your other abstraction by developing a game using digital dice (freeonlinedice.com). Make a set of rules for numbers 1-6, i.e. if I roll a 3 I have to _______. Devise a set of rules that are interesting and fun for you to play with. Roll the dice at least once for each square to determine how you will arrange or modify your design/shape/form. Once completed both abstractions identify 3-5 colors (you may also use their tints, tones and shades) to complete your image. Grid-based abstraction using variations on a single stroke/line.